Hoop Nut #UAAP79 Ateneo Blue Eagles De La Salle UAAP #UAAP79 Finals Roundup: Green Archers clinch ninth men’s crown! 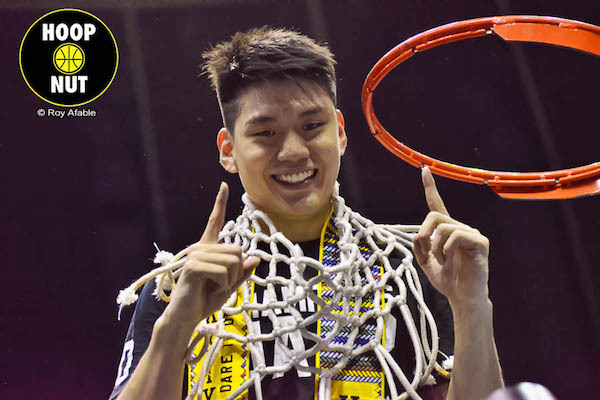 Jeron Teng ends his UAAP playing days a champion once again. The De La Salle Green Archers did it. Pegged as heavy favorites for the entire season, the Taft quintet fulfilled their potential by completing a series sweep of arch-rival Ateneo de Manila to clinch the UAAP Season 79 men’s basketball title — their second in four years and ninth overall. The De La Salle Green Archers completed their quest for the UAAP Season 79 championship as they edged arch-rival Ateneo, 79-72, in Game 2 of the finals on Wednesday at the SMART-Araneta Coliseum. La Salle, which was denied a sweep in the elimination round, was able to sweep the playoffs, finishing the season with only one lone defeat. Jeron Teng matched his season-high of 28 points – 19 of those in a terrific first half performance – to lead his Green Archers in the clincher. Season MVP Ben Mbala added 18 points and 10 rebounds in the win. It was La Salle’s ninth UAAP men’s basketball championship, the most recent one coming in 2013. Teng was named Finals MVP after averaging 19 points on 52-percent shooting alongisde 3.5 rebounds and 2.5 assists. 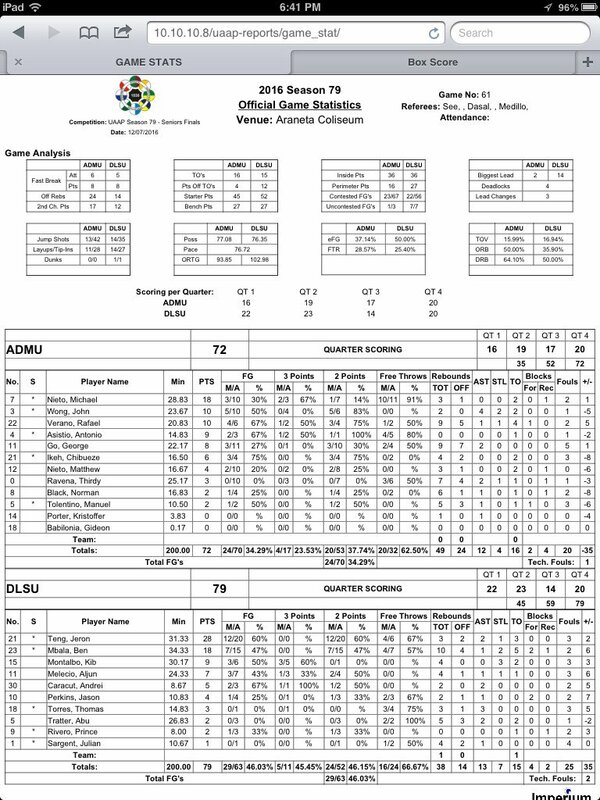 Mike Nieto led Ateneo with 18 points. Jeron Teng (DLSU) - 28pts, 3rebs, 2asts, 1stl. Raffy Verano (ADMU) - 10pts, 9rebs, 1ast, 1stl, 1blk.